Russia last month (September) deployed a naval task group, spearheaded by the missile cruiser Moskva, to operate off the coast of Syria. The cruiser’s voyage followed on from earlier deployments of the destroyer Smetlivy, along with an intelligence-gathering vessel and amphibious warfare ships, all reportedly heading for a Syrian port or waters off the Levant. This was all simultaneous with troops and fighter jets being sent to bases in Syria and an advisory notice issued by Moscow for a major exercise this month (Oct) scheduled to include live firings of missiles. According to the Russian defence ministry its naval units are rehearsing Anti-Submarine Warfare (ASW), anti-shipping and air defence tactics, in addition to carrying out Search and Rescue (SAR) training. Russia has requested civilian aircraft should avoid air space between Cyprus and the Russian Navy’s support base at Tartus in Syria. The Russians have maintained the naval exercise is not related to what they describe as a long-planned increase in the usual military technical assistance provided to Damascus. Moscow has, after all, made no secret of its support for the embattled regime of dictator Bashar Al-Assad. Russia’s injection of strike jets and hundreds of military ‘advisors’ (including marines) and armour (including APCs, tanks and self-propelled artillery) is clearly an effort to shore up the last bastion of Damascus and its surrounding territory. Assad’s regime has lost 80 per cent of Syria to rebels, not least ISIL, which dominates vast swathes of both Syria and Iraq. The regime appeared to be doomed until the current intervention. As expected the Russians have launched air strikes from the Syrian bases. To the USA’s consternation these have not primarily been against the ISIL terror group. The Russians have mainly targeted the US-supported Free Syria Army (FSA) and other rebel forces. Within days of the rolling bombing campaign starting, it was enhanced by the dramatic twist of missiles being fired into Syria not from the eastern Mediterranean but by some of the Russian Navy’s most modern warships cruising in the Caspian Sea. A computer-generated image of a Kaliber cruise missile flying to target. Twenty-six Kaliber missiles were launched by four vessels of the Caspian Flotilla – a Gepard Class frigate and three Buyan Class corvettes – and flew around 1,000 miles, with some of the route to target above Iranian and Iraqi territory. Again, these were thought not to be against ISIL but other anti-Assad groups. The Russian defence ministry claimed the cruise missiles did hit ISIL targets. 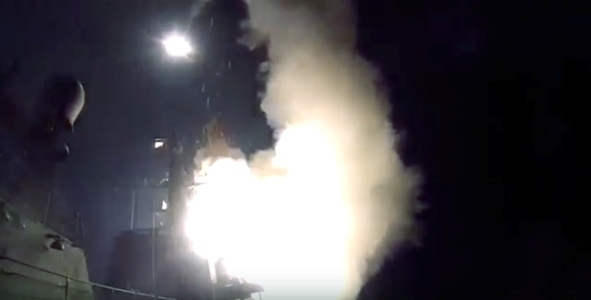 It was a remarkable event, for it was the first such firing in anger for the Russian Navy for many decades, though the Pentagon claimed some of the cruise missiles crashed onto Iranian territory. Simultaneously, showing a much better co-ordinated all-arms approach than the US-led campaign against ISIL in Syria and Iraq, Iranian and Hezbollah ground troops joined the Syrian Army in a determined ground offensive. Beyond all that, President Vladimir Putin of Russia sees the current situation in Syria – and the West’s militarily hesitant and botched response to the aftermath of the so-called Arab Spring across the Middle East – as a means to begin his big play to re-establish hegemony once enjoyed by the former Soviet Union all the way from Yemen to Egypt, Syria and across North Africa. This time around the driving factor is not the spread of communist ideology but rather a more traditional Great Game. Putin’s Russia is seeking to control vast reserves of oil and gas and dominate the territories across which are laid overland pipelines that supply the West. He is also seeking to have influence – Putin would probably say safeguard – Sea Lines of Communication (SLOC) along which global trade passes. The vacuum left by a lack of significant Western military action has allowed the creation of a vast playground for the lunatic fascists of ISIL all the way from the banks of the Tigris and Euphrates to the borders of Turkey and across to Libya and beyond. The terrorists have thrived due to broken (or absent) systems of government in States of war and anarchy that Russia – which has already proved its hybrid warfare works in the Crimea and eastern Ukraine – is now poised to capitalise on as the so-called saviour of Western civilisation. Moscow is filling the vacuum of leadership and matching its political inroads with commensurate military action. 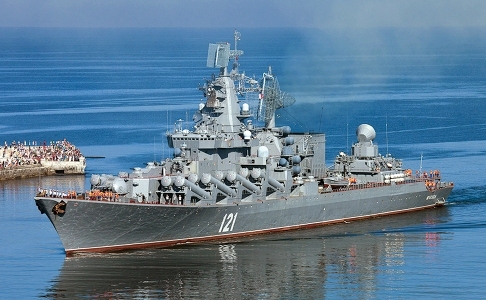 The Russian Navy cruiser Moskva, which is now off the coast of Syria. In the meantime, as Moscow’s warships cruised off the coast of Syria, there was no sign of the US Navy also positioning a Carrier Strike Group (CSG) as might have been the case from the Cold War right up until recent times, to counter the Russian presence. NATO’s Standing Naval Group 2 (SNMG2), which has since Spring 2014 spent a lot of time in the Eastern Mediterranean and in the Black Sea, was (as Moskva deployed from Sevastopol) engaged in an ASW exercise off the Sicilian coast. 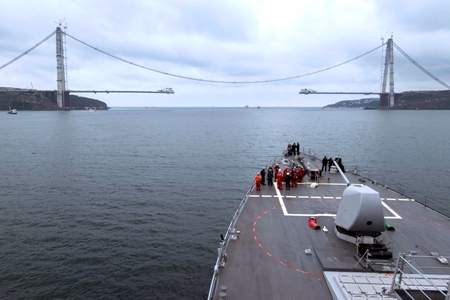 Within a few days of the Russians initiating their air campaign in Syria, the US Navy destroyer Porter, one of the four BMD-capable destroyers from Rota passed through the Turkish Straits and into the Black Sea. With powerful AEGIS combat system, the Porter no doubt was part of an effort to reassure Turkey that NATO would back it up following protests by Ankara to Moscow about Russian strike jets trespassing into Turkish air space. There is no doubt that per ship, NATO’s major maritime units are more modern, powerful and capable than Russian warships deployed off Syria. The key quality the Russian Navy’s units, from the Arctic and Atlantic and into the Caspian, enjoy is the willingness of their political masters to use them audaciously to make geo-political friends and influence them. The true purpose of the Russian Navy’s eastern Med exercises and Caspian missile launches is clearly to safeguard the seaward flanks of an ever-bolder military intervention in pursuit of Putin’s grand strategic vision. During the latest ‘Britain and the Sea’ conference in the UK Rear Admiral Chris Parry suggested Russian and Chinese determination to control vast areas of ocean, as they might the land, poses one of the greatest threats to world trade and peace. See our report on P3 of the November 2015 edition. Beyond the current Syria gambit that is the objective of Putin’s Russia, which seeks closer links with China in global maritime operations. The navies of the both countries recently completed their largest joint exercise, involving 20 surface warships, submarines and other maritime units, operating in waters off Vladivostok. It followed exercises between the two navies held in the eastern Med and Black Sea in the spring. The Russian defence minister explained that the aim for Russia and China during the latest naval manoeuvres was to pool their efforts in order to “shape a regional security system”. Make that a global new order. • This article is an edited and revised version of a leader commentary to be published in the November 2015 edition. For more on Syria, see our news and analysis articles in the same edition of WARSHIPS IFR. A Russian warship launches a cruise missile from the Caspian Sea. The Ballistic Missile Defence (BND) destroyer USS Porter passes through the Bosphorus Strait as Russia continues air strikes in Syria.